Merchants and Maji by William C. Tracy. Space Wizard Science Fantasy, 2016. Ebook. 174 pages. 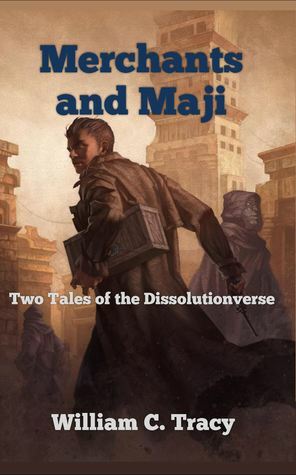 Merchants and Maji is a science fantasy novella that consists of two tales set in William C. Tracy's Dissolutionverse. This was my first foray into the Dissolutionverse world and the writing of Tracy, and it proved to be a thrilling and wildly entertaining read. The first installment, "Last Delivery," introduces a delightful cast of characters that I feel really brought this story to life. Prot is a passionate and endearing character that immediately made me want to root for him; he is savvy and quick-witted, but he also has his soft spots and is open-minded. His decisions were very realistic, and I found him to be a relatable character overall. Prot's girlfriend, Amra, is also a highly relatable and enjoyable character, and I loved seeing the interactions between the two of them. The rest of the characters, such as Kamuli and Bhon, brought even greater depth and entertainment to the story, and I liked watching the team work together throughout a variety of obstacles. The second story, "The First Majus in Space," brought forth a different but just as exciting story that introduces readers to the memorable character of Origon Cyrysi, as well as provides a deeper look into Tracy's unique magic system. Origon is a strong-headed character that has no problem taking the lead and asserting his own authority in a situation. I found everything about this story to be intriguing, and I would love to see these characters and worlds expanded into a larger novel. Both stories were the type that pick you up on page one and plop you right down into the middle of this world, where you are then fully immersed in a well-developed and unique world. I've found that books that throw you right into the action with little explanation tend to either be extremely successful, or entirely confusing, so fortunately Merchants and Maji seemed to fall into the former category. Tracy gives us enough backstory and information to understand what is going on, but there is still plenty to discover on your own. Tracy's writing style is swift, thorough, and always engaging. Every once in a while, however, I would come across a scene or set of dialogue that felt slightly out-of-place or awkward, but this was such a minor occurrence that it did not affect my reading experience much. The rest of the story and writing was strong enough that these minor issues could easily be overlooked and overcome as Tracy continues to write. And as much as I loved the unique idea behind this magic system, I feel like it needs a bit more fleshing out, which is something that a short novella just can't quite provide. I think that these two stories provide an extremely promising start for what could be expanded into a more expanded and developed full-length story. The magic system is intriguing, the world-building is meticulously done, and the various races and political happenings provide an abundance of potential. Overall, I am giving Merchants and Maji four stars! You can find out more about William C. Tracy and his work here!